Travelling from coast to coast to bring you stories that shaped history. I’ve always been a history buff, largely due to the influence of my mom talking about her Great Uncle who was was killed in France, and my dad talking about his 3 brothers and sister who served overseas during the Second World War. There, the fire was ignited. I began my television career in 1994 as a cameraman. I felt it was time to speak to my Uncle, Perley Cameron about his overseas experience. For the first time ever, he was ready to tell his story. Sadly, this never was to be. He passed away before I had the chance. Those words will forever drive me forward. In 2005, I was ready. I left news and went full speed ahead and the Memories Recovered Project was born. On June 24, 2011, we re-branded to Veterans Voices of Canada and became a registered non-profit. I’ve been travelling coast to coast and have documented the stories of over 1,500 Veterans. Many more wait to be interviewed. My mission? To document our Canadian military Veterans on camera for history and education, to be donated to schools, museums and libraries. All Veterans have a story, and we at Veterans Voices of Canada would like to give them the opportunity to tell it through our professional video documentation. From WW2 to recent Veterans, we feel it is very important to document their story for history. 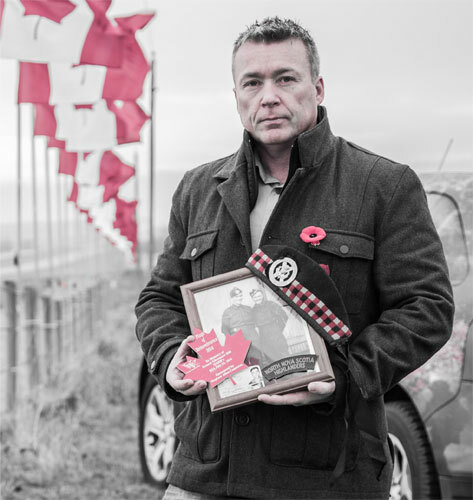 Many RCMP Veterans have served in military capacity, and we would like to document their story along with their military brothers and sisters. the Government of Canada, and extraordinary leaders from coast to coast to coast.